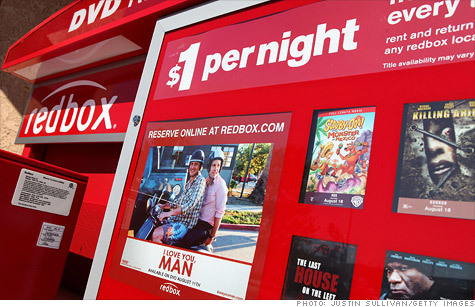 Redbox is teaming up with Verizon to create a streaming video service that will compete directly with Netflix. NEW YORK (CNNMoney) -- Verizon and DVD kiosk company Redbox said Monday that they're teaming up on a streaming video partnership, a move that puts Netflix squarely in their crosshairs. The companies said that the joint venture will launch in the second half of the year, but were otherwise very short on details. The service will offer "subscription services and more," and it will be available on multiple platforms like smartphones, tablets, and televisions. Citing competitive concerns, Verizon executive Bob Mudge said the partners are "limiting our description to 'streaming services and more,'" with more details to come soon. The service will be available to everyone, not just Verizon customers. Few other details on how it will work are available. Coinstar CFO Scott Di Valerio wouldn't comment to CNNMoney about "specific parts" of the service, or on the ways in which it will differ from behemoth Netflix. But he land one jab that seemed aimed at Netflix (NFLX), which features a trove of past-season TV shows and older movies but has been criticized for its lack of newer content. "With Redbox, you get this great, great new-release content," Di Valerio said. "Beyond that, we're not going to speak to that because of competitive reasons." Though the companies aren't ready to share details, Di Valerio said Coinstar decided to announce the service now because it found a partner in Verizon -- the conclusion to a search that Coinstar had already announced publicly. Redbox said a year ago that it would team with "a partner or partners" to create a streaming service. Verizon (VZ, Fortune 500) will own 65% of the company and Coinstar (CSTR), Redbox's parent company, will control the other 35%. Shares of Coinstar closed 1.8% higher on Monday. The streaming service will leverage content provider relationships that Verizon has built up through its VCast streaming video business for mobile phones, as well as its large cloud computing infrastructure. It will also take advantage of Redbox's 28,000 kiosks around the country to supplement streaming video options. That's not exactly the never-leave-your-home promise of Netflix, but customers won't have to wait a day or two for the mail to arrive. "By offering instantly available online and mobile content with immediate access to physical media through rental kiosks, Verizon and Redbox will be uniquely positioned to deliver the best of both worlds -- digital and physical," the companies said in their partnership announcement. Despite Netflix's dominance in streaming video, it has a growing field of challengers. Amazon's (AMZN, Fortune 500) Instant Video service and Hulu Plus have each tried to take on the streaming video leader. So far, they haven't been able to muster up much of a fight: Netflix said last month that its chief competition's streams represented about 10% of Netflix's. -- CNNMoney staff writer Julianne Pepitone contributed to this report. Blimey! Netflix launches scrum with Amazon in U.K.